Jill founded Stoke Cold Press Juicery on a passion to offer the best food possible to her community. Jill's family has run a local produce market in Kimberley, BC for the last three decades. Her parents taught her two things early on: how essential it is to source fresh produce directly from farmers, and how important it is to make personal connections with the people who grow your food. These simple truths remain at the heart of everything Stoke does. Stoke was the result of a passion for wellness and experimentation - using the beautiful organic produce on hand to play around with new recipes and ideas. Eventually, the incredible health benefits and principles of cold-pressed juicing seemed like a natural evolution. A way to offer the Kootenay region an unpasteurized and unprocessed way to consume organic produce: from farm to bottle. We live in a special part of the world that values healthy lifestyles and outdoor adventures. Community is the life force that runs through everything we do, from harvesting the apples from our neighbour's trees, to sharing good food with friends after a heart-pumping bike ride. Stoke takes pride in creating warm relationships with our farmers, customers, and the businesses we collaborate with. We strive to do our part to help support and sustain healthy communities every day. The Kootenays are a fertile growing area, with many local and organic farms, and an abundance of fruit coming out of the Creston Valley and the nearby Okanagan. Stoke strives to juice our produce the same day it's picked as much as we can. 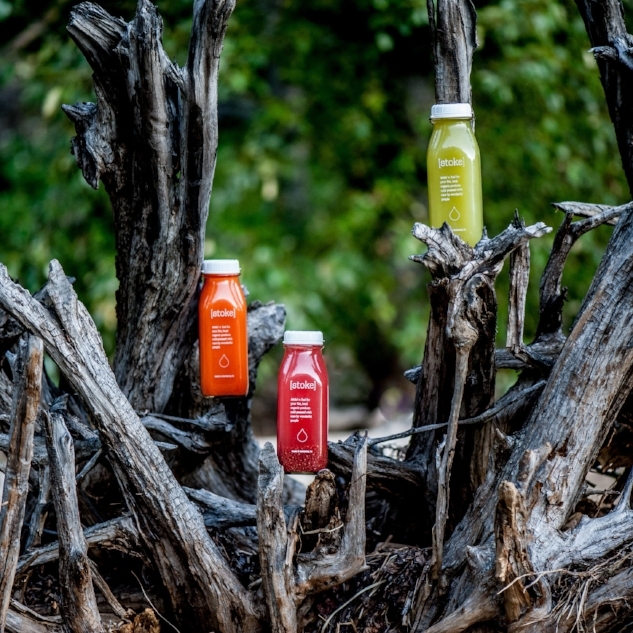 The fruits and vegetables that go into our juices are always organic, purchased from farmers who use sustainable growing practices, and are locally-grown when possible. Stoke is committed to supporting the environment and keeping our footprint as small as possible. When you pick up a bottle of Stoke, you can trust you’re getting quality cold-pressed juice that not only tastes delicious, but helps you and your community thrive.